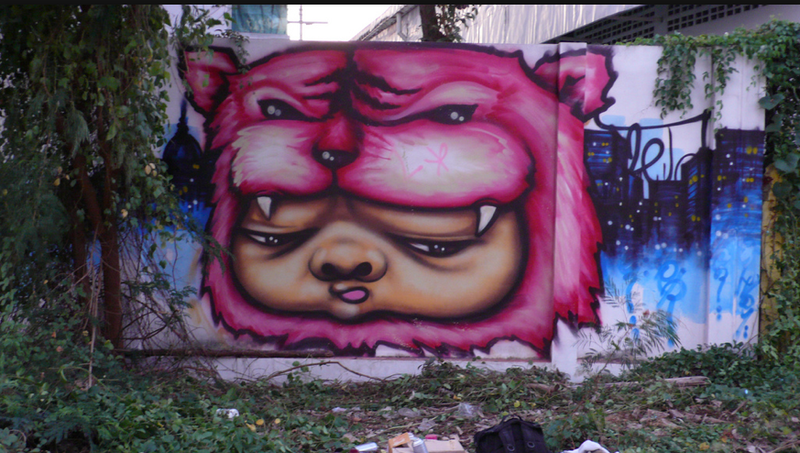 Patcharapol Tangruen, also known as Alex Face, is a Thai street artist, who studied architecture at Bangkok’s King Mongktut Institute of Technology. His interest in architecture led Alex Face to explore and wander the streets and alleys of Bangkok for abandoned buildings where he eventually started developing his street art. For Alex Face street art is as much about interacting with life and people as it is about the creation and execution of the art itself. His most well known character – a quizzical smoking baby who looks wise beyond his years – was inspired by his two-year-old child.